Apparent contradictions and other Bible difficulties are due mainly to carelessness in reading the Bible. This article shows how many difficulties can be solved by studying more carefully. WHY DO people misunderstand the Bible? Once you understand what your attitude should be toward Bible study, and once you know the right method of studying, you can examine more closely why people often don't understand what the Bible says. "2) As it does happen in a few cases, a mistake has been made by an early copyist in writing out the ancient documents now in our possession" (Scripture of Truth by Collett, pages 115, 116). Carelessness in reading the Bible and ignorance of what it says is also a major cause of difficulties and seeming contradictions. Here is what Sims says about this: "Since so much knowledge is proved to be necessary to a right understanding of the Bible, we may easily believe that difficulties, or seeming contradictions, which occur to us in reading it, most probably arise from our ignorance or inattention" (Helps to Bible Study, by A. Sims, page 100). All the difficulties in the Bible — the "glaring inconsistencies," the seeming "self-contradictions," and the "manifest discrepancies" — can be found to be in one of several major groups. The first group of difficulties to consider are those due to present-day ignorance of conditions and circumstances under which the Biblical books were written. Because of ignorance, people misunderstand the time when the events were recorded and the commands given. Whenever there is a time gap between one passage and another, there may have been a change in the circumstances. This difference will explain some apparent discrepancies and remove any hint of a contradiction. In this group we can include those "moral difficulties" having to do with the conduct of people in Old Testament times — the difficulty of understanding why God commanded Israel to exterminate the Canaanites when Christ said we are to love our enemies — of understanding why polygamy and other things were practiced by men of the Old Testament. People of the Old Testament didn't have a complete understanding of God's ways not having the fullness of the Holy Spirit to guide them as those living after the coming of Christ. It was those "times of ignorance" that God "winked at" or overlooked (Acts 17:30). We cannot judge the conduct of people living in Old Testament times by the standard given by Christ and His apostles. We must consider when the act took place in a man's life before making a proper evaluation of his character. Jacob and David practiced polygamy before their conversion — but they repented of this and had only one wife after conversion (see the article, "Here's the Plain Truth About Old Testament Polygamy" in the October, 1963 PLAIN TRUTH, page 13). Some difficulties are caused by carelessly assuming who is doing the speaking. Words are even attributed to God when Satan is actually the speaker. When we say that the Bible is the Word of God — inspired by God with His authority — we don't mean that God is the speaker in every single quotation the Bible contains. The Bible often records what others say — good men, bad men, inspired men, uninspired men, angels, holy or fallen and Satan himself. The record of what they said is absolutely true, but the words they said may or may not be true. Genesis 2:17 says: "Thou shalt surely die" and Genesis 3:4 says, "Ye shall not surely die." Is there a contradiction? No! The first verse gives the words of God — the latter, the words of Satan. It is true that the Devil said these words recorded in Genesis 3:4, but he told a lie — a lie believed today by those who say man has an immortal soul. Careless readers of the Bible don't notice who is doing the talking. They will tear a verse right out of context regardless of the speaker. Many difficulties in understanding the Bible arise from not noticing who is speaking. Always notice who is speaking and what is said. The Bible will sometimes record what a man said to God which may or may not be true. In studying the Bible, if God is the speaker, believe what He says. If an inspired man is the speaker, believe what he says. If an uninspired man is the speaker, judge it according to the law and the testimony of what God has said and revealed. (Isa. 8:20.) What is said is perhaps true, perhaps false. If the Devil is speaking, remember that he was a liar from the beginning, but even he could tell the truth at times, or he will mix truth with error. Ask yourself: "Whose are these sayings? Are they recorded as being inspired, or inserted ns a mere matter of history? Does the writer endorse the statements as being true, or merely record them?" The answer to these simple questions will often be the only solution a problem needs. Even between the inspired writers of the Bible there may appear to be disagreements or contradictions. One reason is because a basic idea can be said in different ways. When Christ was tempted by Satan, He quoted from the Old Testament and said: "It is written, That man shall not live by bread alone, but by every word of God" (Luke 4:4 and compare with Mat. 4:4). But the original quotation in Deuteronomy 8:3 says: "Man doth not live by bread only, but by every word that proceedeth out of the mouth of the Lord doth man live." Both scriptures convey the same basic idea though phrased differently. Inspiration doesn't prevent a writer from using his own personal method of expression. Haley says: "Inspiration does not destroy the individuality of the writers. It deals primarily with ideas, rather than with words. It suggests ideas to the mind of the one writer, allowing him, generally, to clothe them in his own language. In this way his individuality is preserved, and his mental peculiarities and habits of thought make themselves felt in his writings. On this principle we account for the marked difference of style among the sacred writers, as well as for their occasional divergences in setting forth the same idea or in relating the same circumstance" (Alleged Discrepancies of the Bible by John M. Haley, pages 6 and 7). You can compare Isaiah 61:1, 2 with Luke 4:18, 19 and see how Christ quoted from the Old Testament. He didn't follow it word for word. Also notice how Matthew condenses Isaiah 9:1, 2 in Matthew 4:14-16. An inspired Bible writer was not required to follow the same routine of words. When New Testament writers quoted from the Old Testament, they didn't think it wrong to modify those quotations. They grasped the sense and basic thought of the Old Testament writer and then molded that thought into the form that would best serve the people to whom they were writing. This principle accounts for the apparent discrepancies between the phraseology of the Old Testament and the citations in the New. Consider also the point of view and objective of each writer. Two Bible writers may approach the same subject from two different angles. Both accounts must be studied to see the whole truth. Writers also have different methods of arrangement. One writer may follow a strict chronological order. Another, groups associated ideas together. While one will write history in detail as the events took place, another will omit some events, condense others, or expand them. One writer may give us an orderly, well-constructed biography, but another may give us merely a series of stories grouped together to illustrate some specific point. In recording the same event, different writers may record different circumstances, same giving more facts and some fewer. A more complete account will include the facts given in the shorter one and the shorter account will not contradict the more complete one. This solution is especially useful when studying the four Gospels. The differences in the four Gospels are due to the fact that the writers did not depend on one thing nor draw their accounts from one source. Each one gives only an incomplete history, introducing those details with which each writer was familiar. If we knew all the circumstances of the case, those which we now know would seem to fit perfectly into their appropriate places in the account. Not one of the Gospel writers gives, nor intended to give, ALL the details. Each selects those particular facts which seem to him to be the most important and passes by incidental points. Each writer records only what referred to his own particular purpose or experience. Thus, many of the minor connecting facts have not been preserved and recorded. Therefore, we must fill in the missing facts ourselves by resorting to deduction and possible explanations. Here is what Sidney Collett says about this point: "Let those who imagine they have discovered errors and contradictions in the evangelists' writings remember how easy — indeed, how natural — it is to give three or four accounts of one circumstance from different points of view, each account being quite different from the others, and yet absolutely covert" (Scripture of Truth, page 140). You will notice that the Gospel of Matthew doesn't follow any chronological series of events or instructions, but groups together associated ideas that portray by living pictures what Christ was like in various circumstances. Mark and Luke are generally chronological. Realize that each writer followed his own method of arrangement and told his account in his own way. Because the personalities of writers differ in the way they express themselves doesn't mean they disagree with each other. Writers may also differ in reckoning time. The nation of Israel used both a civil and sacred calendar. The sacred year began in the spring with the month Nisan or Abib. The civil calendar was reckoned as beginning in the autumn with the month Tishri. If two writers disagree on the month and day of an event, we must see whether or not they use the same calendar for reckoning. If one bases his date on the sacred calendar and the other uses the civil calendar for his computation, both would actually be correct once we understand the difference in reckoning. Some say John 19:14 contradicts Matthew 27:45. John describes events before the crucifixion which he says took place at the "sixth hour." Matthew says darkness covered the land after the crucifixion from the sixth to the ninth hours. Mark 15:33 and Luke 23:44 say the same. Obviously, John is using the Roman reckoning of time — counting from midnight. To John, the "sixth hour" was 6 o'clock in the morning. According to the Jews' reckoning of time, this was the first hour of the day. When Bible writers seem to disagree as to numbers and dates, there is no discrepancy unless it can be proven that they intended to reckon from the same point and by the same method. To some people, the language in which the Bible was written will make it difficult for some parts to be clearly understood. Since the Bible is a book for all ages and for all kinds of people, it was written in the kind of language and terminology that could be understood by the common people of all ages. The Bible is not a scientific textbook. Though it does give the basic foundation for understanding science, it is written in language for the average man — not in some technical and scientific terminology that could be only understood by scientists and experts in fields of technology. When the "sun stood still" during the time of Joshua's long day, the Bible is not speaking in the language of scientists. Technically the earth stopped rotating. But to the observer on earth the "sun stood still." Much of the Bible is written in the form of poetry or in language that is descriptive or figurative. As an example, notice the description of a thunderstorm in Psalm 18. In Psalm 42:9, David describes God as a rock and in Psalm 91:4 speaks of His wings and feathers. There would be no end of such "absurdities" if you were to interpret such passages in a literalistic and matter-of-fact way. You can know when a scripture is speaking in a figurative language if you are honest and use common sense when studying it. Writers will also express things in different ways. Certain things may be said to be done by one man in one place whereas in another place it may be said to be done by another person who acted on his behalf (see Mat. 8:5-6 compared with Luke 7:2-3 and Mark 10:35 compared with Mat. 20:20). Sometimes the plural is used when the remark is actually to be applied to one person only (see Mat. 26:8 and John 12:4; Mat. 27:44 and Luke 23:39-42). In these cases there is actually no contradiction. Some difficulties in the Bible may be due to errors made by men who copied the manuscripts or by those who translated the original Hebrew and Greek into English. You need to realize that the original manuscripts of the books that compose the Bible no longer exist. The original manuscripts were copied many times and though they were copied with great care and exactness, some minor errors crept into the copies that were made. But through careful study, we can know what the original text was. There is not one important doctrine that depends on any doubtful reading of the text. The errors due to copyists are trivial for all practical purposes. They usually are in relation to numbers and the spelling of names — technical points that have no bearing on salvation and the purpose of life. Errors in figures would be easy to make, especially since Hebrew figures are made by using letters of the alphabet — letters that appear very much alike in many cases. As an example, the first letter of the Hebrew alphabet represents the number one. With two little points above it no larger than flyspecks, the number becomes a thousand. A copyist need only to make a very slight error to make a great change in figures. "Although it is certain that the words were often spelled out, the fact that signs were often, though not universally used, would be enough to account for all the discrepancies in numbers found in the Old Testament" (Peloubet's Bible Dictionary, page 457). More serious are the errors of the translators — the men who translated the Hebrew and Greek texts into English. In some cases, the English translation gives a wrong meaning to the words or expressions of the original Hebrew or Greek. One such glaring error is in Matthew 12:40 where we read that Jonah was swallowed by a "whale." Perhaps there are types of whales that can swallow a man, but, in any case, this is not an accurate translation. The original Greek word means "great sea monster." Christ was referring to Jonah 1:17 which says it was a "great fish" that swallowed Jonah. Discrepancies may frequently appear in the King James Version when none actually exist in the original text. This is because the translators have used the same English word to represent several Hebrew or Greek terms. For example, Luke 13:24 would appear to contradict II Timothy 2:24 because of how the word "strive" is used. Different Greek words are used, but translated the same. The term in Luke should have been translated "agonize." 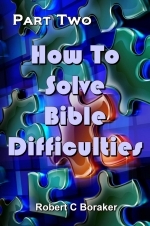 Other principles that will help you solve Bible difficulties will be given in the next installment. Don't miss it.